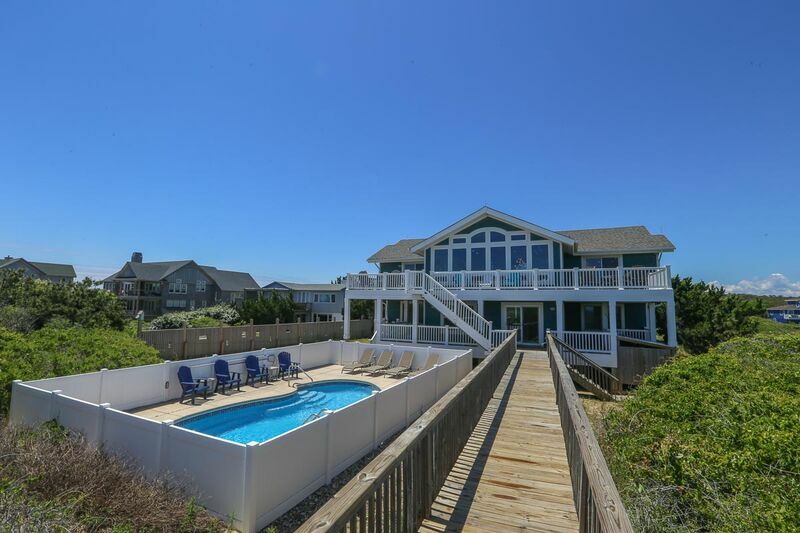 Enjoy spectacular ocean views from this beautifully remodeled oceanfront home. The new renovations include a Private Pool, completely remodeled great room including kitchen with custom cabinets and stainless steel appliances. Your family will want to return year after year! 6 bedrooms (3 master bedrooms: 2 with Queen with tiled baths and deck access; 1 with Queen, bath with tub and shower; 1 bedroom with Queen, 1 bedroom with Twins, 1 bedroom with Bunk set and Twin), shared bath with tub and shower; den/rec room with pool table, CATV, DVD player; laundry. Great room with vaulted ceiling, hardwood floors and a gorgeous ocean view with a spacious deck to take in the wonderful sights of the ocean. Flat screen CATV with DVD player. Eat-in kitchen with wet bar and breakfast bar, as well as an additional dining table; powder room. Master bedroom with King and bath with tub and low-threshold shower, small deck off bedroom. Beautifullly furnished and decorated. We would suggest some full length mirrors, tvs in the bedroom, a radio, and umbrella tables around the pool and more lounge chairs around pool.